Ivory Palms Resort has recreational facilities including 3 lagoon style swimming pools (1 heated), 2 spas (1 heated), sauna, 2 full size flood-lit tennis courts, games room and conference centre. Offering 1, 2 and 3 bedroom air-conditioned apartments, Villas and townhouses with full kitchen and laundry facilities. 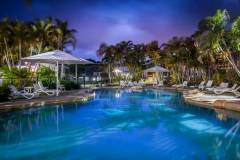 Walking distance to restaurants, cafes and Noosa River. Bus service from outside the resort every 15 minutes to Hasting Street and the beach.